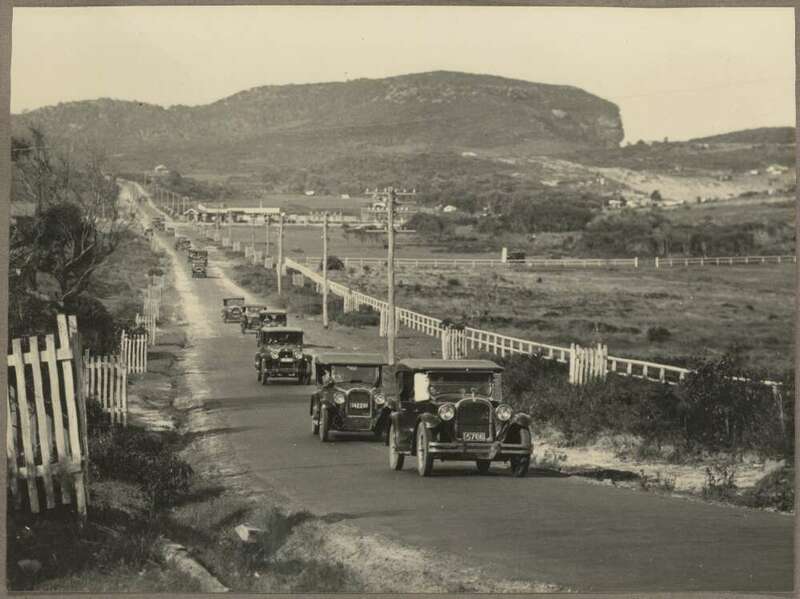 Above: Motor cars driving along road, Avalon, New South Wales, 1930 Retrieved from http://nla.gov.au/nla.obj-147289886 - courtesy National Library of Australia - Avalon Public school will be built to the left of this image. Buyers Interested in the Pride of Avalon Estate, Avalon, will be motored to Inspect it by Messrs. McLaughlin and Co., of 72 Pitt-street, city, the managing agents. 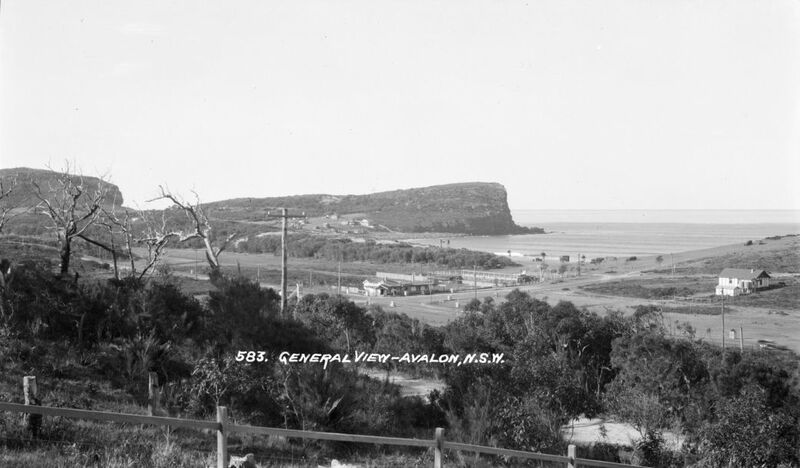 As shown above, the sale of land in Avalon Beach began in earnest during the 1920's and was pursued throughout the 1930's through the promotion of Avalon Beach as a healthy and beautiful area by Arthur Jabez Small early in 1921 and followed by others either in conjunction or independent of Mr. Small. Cronulla was, Palm Beach is, and Avalon Beach will be. When the history of Avalon is written, one man's name in particular will be outstanding. It is that of Mr. A. J. Small. Not only has he given headlands and parklands to the people to preserve for them vantage points from which ocean views can be seen for all time, but he is still giving. His last act of graciousness was when he gave an area of seven acres of land at half value in order that the Wild Life Preservation Society could acquire its Angophora Park. Mr. Small also erected the fence and iron gates, made the approach, built the steps, and cleared the paths so that the giant Angophora (sometimes called Red Gum) which is said to be 1,000 years old and of immense girth, may be viewed in its natural surroundings. At the time of the opening (by Sir Phillip Street on March 19th) there was an improvised orchestra of birds — butcher birds, soldier birds, warblers, and jackasses, in fact a representative from practically all the feathered families — which came down to look curiously on the people who attended the opening and to contribute, to the scene. 'Set aside by' the Wild Life Preservation Society of Australia, primarily for the preservation of a giant example of the Sydney red-gum (Angophora lanceolata), the Angophora Reserve, at Avalon, was officially opened on Saturday afternoon by Sir Philip Street. The president of the society (Mr. W. G. Kett) said the reserve was a memorial to the line work in the cause of science done by their secretary, Mr. D. G. Stead. Sir Philip Street said that the society, in preserving this great tree as a natural monument and setting apart the area with its interesting fauna and flora, was rendering a public service. The magnificent angophora, on which many axemen must have cast covetous eyes, was. he had been told, about 1,000 years old. Mr. Kett said that, in the reserve, which contained about six and a half acres, there were many varieties of Australian trees and shrubs, and it was also the rendezvous of some of the most beautiful Australian birds. Other speakers were the president of Warringah Shire, Councillor Green, Messrs. R. T. Baker, and D. G. Stead. NEW GOLF HOUSE, AVALON GOLF COURSE Architect: E. Lindsay Thompson Builder: F. C. Fripp. First established in 1923, the Avalon Beach Golf Links will form part of a new round of Pittwater Fields of Dreams History pages in later 2016. Australian National Archive records indicate numerous people who attained Australian citizenship during 1941 all settled at Avalon Beach. After the cessation of World War Two hostilities Avalon Beach was still an affordable place to live for the many newly married couples, people moved here and, despite post-war shortages, managed to establish homes. Those that could not do so immediately lived in the Avalon Camping Grounds (some for many years until this was closed in 1953) or in caravans installed on building lots. "Miraculous" is how Mrs. Preston, now of Avalon. N.S.W., describes the change in her mental and physical well-being after only ten weeks of taking a tiny daily dose of Kruschen. READ MRS. PRESTON'S LETTER FOR YOURSELF "After living in London throughout the war and experiencing the horrors of both day and night bombing raids, which had an adverse effect on my health, there followed six years during which I suffered from insomnia and acute mental depression. At 31 years of age I felt completely worn out. Photo: Mrs. Preston finds the calm of living In a caravan at Avalon mighty different from wartime London. Feel different, too, thanks .to Kruschen. Kruschen's skilful combination of six natural salts will stimulate liver and kidneys to function properly. Then the little daily dose" of Kruschen will keep you fit and well. Like Mrs. Preston you'll say "Kruschen forever." Trial Size ..- 1/9 SALTS Large Economy 3/ . At Chemists and Stores The Tonic Effect of Kruschen Keeps Millions of Fit. GET THAT FAMOUS KRUSCHEN FEELING! Warringah Shire Council records from before this conflict, and after it, for years, are filled with residents petitions and letters requesting attention be paid to the roads, which were 'dangerous' according to most of these letters, and for attention to be paid to flooding, which was centralised close tot he beach and on the flat areas around Avalon Parade and adjoining the then still intact camping area. Then, as more recently, many of this letters are inquiring why, with so many more homes and rates being paid, there is no corresponding indication of this being invested back into much needed infrastructure, or upgrades of roads. Petitions from Tasman Road, from the roads around Queens parade, from Careel Bay and roads around Avalon Parade indicate that between 1946 and 1950 there were many more people living here full time. The valley of Avalon had hanged from being a holiday resort, visited by country and urban people alike at holiday times, to being a new suburb of a growing city. THE PUBLIC WORKS ACT, 1912, AS AMENDED. IT is hereby notified and declared by His Excellency the Governor, acting with the advice of the Executive Council, that as much of the land described in the Schedule hereto as is Crown land is hereby appropriated, and so much of the said land as is private property is hereby resumed, under the Public Works Act, 1912, as amended, for the following public purpose, namely, a Public School at AVALON, and that the said land is vested in the Minister of Public Instruction as Constructing Authority on behalf of His Majesty the King. Dated this seventeenth day of November, one thousand nine hundred and forty-eight. E. J. HEFFRON, Minister of Public Instruction. The first headmaster of Avalon Public School, Les McGuire, stands rather disconcertedly amongst the debris that would become the first playground and assembly area. The building was a ‘demountable’ and lay in parts in mud during some heavy rain in June and July until the weather cleared to enable construction. The telegraph poles behind the bulldozer mark the line of Old Barrenjoey Road - Geoff Searl, ABHS President. Picture courtesy Avalon Beach Historical Society. 1950: The first school building of Avalon Public School late in 1950 after 66 pupils from Newport Public School, who had travelled from all points north of Newport to get to school, became the first pupils of the new Avalon Public School. Doss McGuire, with the white hair, was the headmaster’s wife who taught Kindergarten to 3rd grade in one half of the building. Much-loved teacher Bonnie Kissen stands behind Doss wearing sunglasses. - Geoff Searl, ABHS President. 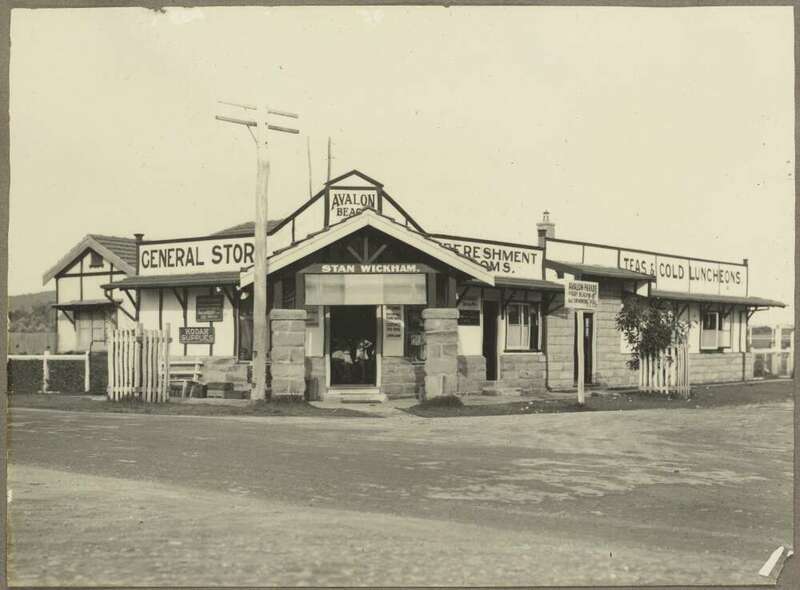 Picture courtesy Avalon Beach Historical Society. (20) Education Department, 27/7/50, stating that the Department's school site at Avalon comprises Lots 2/13 and 27/30, that Lots 8/13 are separated from the balance of the site by a Avalon laneway 20ft. wide, and inquiring whether the Council would be School prepared to agree to the closing of that portion of the laneway Site shown on the accompanying helio, and its incorporation in the school site in order that the Department's land might be 26. consolidated. Resolved, - That the Council do not agree to the request, owing to the fact that a dead-end would be created between Bellevue Avenue and Barrenjoey Road, and inconvenience would be caused to adjoining land owners. 8)Avalon Beach P & C Association, 4/8/50, requesting that the planting Association be supplied with trees for planting in the grounds of the school to be opened at Avalon in the very near future. 20 .Resolved, - The Association be informed that trees will be supplied, that they should be planted from 40 to 60 ft. apart, and the work done under the supervision of the Engineer. 20) Avalon Beach P. & C. Association, 1/9/50, inquiring as to the possibilities of hiring a grader and driver for a few hours to work on the grounds of the new school at Avalon Beach. 33. Resolved, - They be informed the trader will do this work as soon as the ground dries up, two attempts having already been made to carry out the work. (21) Warriewood Beach S.L.S. Club, 4/9/50, nominating for appointment as Beach Inspectors V. Waugh, O. Settler and R.C. Smith. Resolved, - That the Club be asked for particulars as to membership, names and addresses of its President, Secretary, Treasurer, etc. 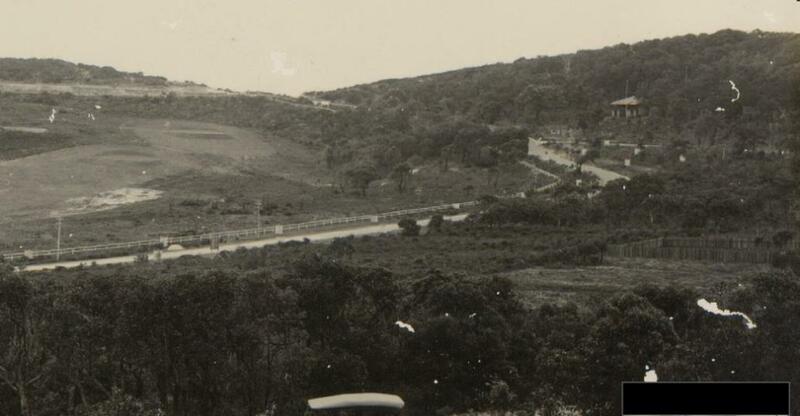 (32) Avalon Beach Progress Association, 4/9/50, asking that the authorised work of kerbing and guttering the western side of Old Barrenjoey Road between Avalon Parade and Sanders Lane be treated as urgent. Mr W. H. Nelson, Headmaster of the Coolongolook Public School, for the past two years, has had notice of his transfer to the Coopernook Public School; the transfer to take effect during the May vacation in about five weeks time. Avalon Parents & Citizens Assoc., 24/5/51, expressing appreciation for the work done in Old Barrenjoey Road and Sanders Lane, Avalon, which has proved of benefit to the school children, and stating that the workmen showed great kindness to the children, and if possible, "we would like them to know that this was indeed a pleasure to see". "Received"
Schools could not be built quickly enough to provide for Australia's increasing population, the Minister for Education, Mr. R. J. Heffron, said yesterday. "The scope of our problems can be realised from the.fact that a new classroom and a new teacher are necessary for each 40 pupils." Mr. Heffron was speaking at the opening of the Avalon Primary School. He said the biggest difficulty in providing enough schools was the shortage of men and materials. Photo: The Organiser of the N.S.W. Division of the Arts Council (Mr. G. Horswell) and Mr. Arthur Murch, winner of the Archibald Prize for 1949, examining one of the entries in the ‘Newcastle Sun’ Children’s Art Show. Mr. Arthur Murch, visiting painter and winner of the 1949 Archibald Prize, has some good advice for schoolchildren intending to enter this year's 'Newcastle Sun' Children's Art Show. •	Find a simple pattern of not more than five or«-six distinct parts and avoid complex structures. •	Not try for adult expression, but keep within the scope of their own experience. Mr. Murch is particularly, qualified to offer advice, quite apart from the success he has achieved as an artist. In his class of children at Avalon Mr. Murch is seeking to inspire artistic perception unfettered by the rules and regulations of stereotyped painting. After the children had given several items short addresses on the value of trees and the need for their protection were delivered by Mrs. A. Wyatt, a vice-president of the Forestry Advisory Council and a member of the Kuring-gai' Tree Lovers' Civic League, and Mr. E. Breakwell, former organiser of Junior Farmers' Clubs, and representing the Australian Forest League. RESIDENTS of Palm Beach Peninsula are concerned about their colony of koalas—they have, or had, about 60. Some of them think they are in danger of losing them and are holding a meeting at Avalon Beach public school on August 14 to discuss means for their preservation. There is, I understand, some difference of opinion, as to whether the koalas will continue to thrive on the Peninsula now that so many humans have taken to the spot. 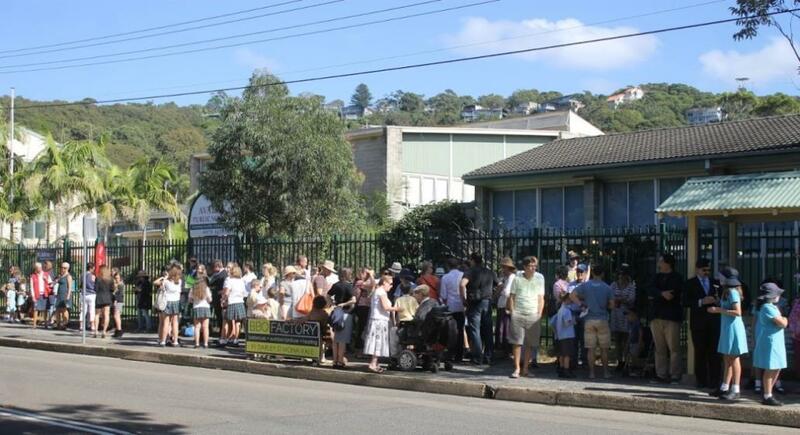 Sydney: A stormy public meeting at Avalon Beach School decided that local residents would arrest any-body seen taking koala bears from their peninsula. The chairman of the meeting (Mr. McDonald) said several residents from the Palm Beach. Avalon, Newport and Mona Vale areas (outer Sydney suburbs) gave evidence of people arriving in cars, taxis and utilities to take koalas from the peninsula. May I congratulate you on your editorials during the past 12 months, and at the same time suggest one on the disgraceful lack of sewerage in many areas of Sydney. The sanitary service is a blot on our supposedly modern city. RESIDENTS of Avalon Beach have formed a branch of the North Shore Flora and Fauna Protection Council and have 60 members. They say there has been wanton destruction of the bushland and of wild birds and animals in the district. MRS. ARTHUR MURCH with models of houses designed for modern living. (See story below). MODELS of 24 ultra-modern Sydney homes-most of them giving the appearance of a bird poised for flight-will be exhibited at Avalon School from tomorrow to next Sunday. They form one section of a display of architectural design, home planning and, interior decoration, arranged by Mr. and Mrs. Arthur Murch, of Avalon, to raise funds for the Junior Craft Club and Parents' and Citizens' organisation. Architects and designers showing models include Messrs. Harry Seidler, Peter Storey, Harold Smith, Frank Fox, and C. Baldwinson. Mr. Fox, who is arranging the display, said all the models show accent on the new trend in functional design, economy of space, light and colour. "In fact, from a womans point of view," he said, "they are a housewife's dream. Basic materials for the houses, as shown in model, are steel, concrete, copper, pine and glass. Many of the rooms are divided by plate glass to permit the entry of a maximum of light. The old bugaboo about sunlight drenching the colours in drapes has been banished by the modern designer,’ commented Mr. Fox. The irony of the above is Mrs. Murch stated in two published books, R. Murch, Arthur Murch: An Artist's Life 1902-1989 (1997- Ruskin Rowe Press) and in Jan Roberts, Remembering Avalon: Growing up in the 1940s & 50s, (2011- Ruskin Rowe Press) as stating that their own home in Palmgrove road Avalon was not alike those that formed this display to arise funds for the school. Gloria (Ria) Mavis Murch (nee Counsell) and Arthur Murch moved to Avalon in 1947 where they would have wanted son John, born 1941, to go to school without too much travel, Newport being the closest primary and infant school then. Their daughter Michelle, born 1951, would have been extra impetus to have a school for resident children. Their home in Palmgove, Block 394, was a 'shell of a house' according to the lady's record, where it took six months to lay floors and she was still hen managing without a kitchen or bathroom and scarce water supply. This was still paradise to Mrs. Murch though, they lived next to Angophora Reserve with all its stately trees and masses of bushflowers, year round. AS will be obvious from the few sample articles run, Ria and her husband were investors in people and community - decades of anecdotes of her supporting local artists, in both their works and by her words, she was a renowned wordsmith, as well as doing the work itself enriched Avalon Beach, and many adjoining societal needs, throughout her life. The photograph below, and sections blown up from it, from then resident photographer Frank Hurley (at Loggon Rock Cabin - Whale Beach - built by Alexander Stewart Jolly) predates 1953, when the Avalon Beach Camping ground was closed, as this can still be seen behind the dunes. This image shows how many homes and holiday places were established during that time from the 1929 empty Priests Flat plains of 'boisterous winds' until 1953. IT is hereby notified and declared by His Excellency the Governor, acting with the advice of the Executive Council, that so much of the land described inthe Schedule hereto as is Crown land is hereby appropriated, and so much of the said land as is private property is hereby resumed, under the Public Works Act, 1912, as amended, for the following public purpose, namely, a Public School at AVALON, and that the said land is vested in the Minister of Public Instruction and Constructing Authority on behalf of Her Majesty the Queen. Dated this seventh day of April, one thousand nine hundred and fifty-four. All that piece or parcel of land containing by admeasurement 13 ¼ perches be the same more or less situated in the county of Cumberland, parish of Narrabeen, Shire of Warringah at Avalon: Commencing on the north-western side of Barrenjoey-road at the south-eastern corner of lot 7, in deposited plan 11,462; and bounded thence on the southeast by Barrenjoey-road bearing 198 degrees 20 feet 0 1/8 inch on the south-west and north-west by lines bearing 286 degrees 182 feet and 16 degrees 20 feet and on the north-east by the south-western boundary of the aforesaid lot 7 bearing 16 degrees 182 feet 8 inches to the point of commencement. Avalon Telephone Exchange.—Supply and install two air-conditioning units.—Carrier Air Conditioning Ltd., 36-40 Bourke St.. Sydney, £3235. A bill of quantities (BOQ) is a document used in tendering in the construction industry in which materials, parts, and labor (and their costs) are itemized. It also (ideally) details the terms and conditions of the construction or repair contract and itemizes all work to enable a contractor to price the work for which he or she is bidding. As well as a concert or two in the school hall - this is obviously people who hired the hall in the Notice below, the Drum Corps, which leads the Vietnam Veterans - Northern each year, as well as a current great Wind Ensemble began during the early years of this school. Art, Dance as well as your three R's have always formed part of the school culture. IT is hereby notified and declared by His Excellency the Governor, acting with the advice of the Executive Council, that so much of the land described in the Schedule hereto as is Crown land is hereby appropriated, and so much of the said land as is private property is hereby resumed, under the Public Works Act, 1912, as amended, for the following public purpose, namely a Public School at AVALON, and that the said land is vested in the Minister for Education as Constructing Authority on behalf of Her Majesty the Queen. Dated this fourth day of September, one thousand nine hundred and seventy-four. by Deputation from His Excellency the Governor. E. A. WILLIS, Minister for Education. With a school motto of 'Respect, Responsibility, Personal Best', coming from a time and place where the environment was respected, the people who lived here respected, and everyone took some responsibility in giving to or builtin the community up, and all strove to do their own personal best, and that's all anyone can ask of anyone else. Parents still fulfill roles in the school canteen with a regular roster that contributes thousands towards a very active P&C Association. The Department of Education is still providing thousands of dollars each year for everything from classroom resources to ipads for students to use. Today Avalon Public school has grown to be home to five kindergarten classes, five Grade 1's and 1 1/2A's, five Grade 2 classes, five Grade 3 classes, three Grade 4 classes, and nine classes at Grade 5 and 6. Outside Avalon Public School 2016 - muster point for ANZAC Day Marches. Of all the many beautiful beaches abounding within reach of a short car run from Sydney, surely there is none, which for sheer loveliness, can compare with Avalon. As one tops the rise above it on the road from New-port, the eye rests with delight on the exquisite picture that it forms. Backed by a dense growth of Angophoras and other native trees which clothe the hills behind it, the vale Itself lies green and restful, and leads the eye down to the golden crescent of the beach. Beyond the rugged grandeur of the rocky point at the far end of the beach, green headlands run out to meet the ocean, and it is within one of these that a cave of unusual formation Is to be found-the peculiarity of which is not observed from the out-side; but walk a little way into its dim re-cesses, then turn and look back, and you will see etched upon the brilliance of the blue water by the outline of the dark entrance rocks,' an almost perfect reproduction of the map of Australia. Coogee and Newcastle Surf Clubs, who have maintained a close social spirit since 1916, held their annual reunion at Avalon Beach on Sunday. Fifty members of the Newcastle Club and 25 from Coogee Club made a happy departure from Coogee Clubhouse early on Sunday morning. Our picture was taken near Palm Beach, a near-Sydney surf resort. The camp shower was appreciated yesterday by bathers at the Avalon camping ground, where many holiday-makers spent the weekend. Hair-setting, after a holiday week-end in the surf, was an important item in the toilet of girl campers at Avalon yesterday afternoon. And even the sergeant gave his help. LIKE Mark Twain's famous pre-demise 'obituary,' our recent reference to ex-Parramatta and Rugby Union international, Stan Wickham, as the 'late,' was 'somewhat premature.' Stan, of course (like Johnie Walker) is still going strong at his seaside home at Avalon Beach and, come January next, he'll be 80 years young. MR. and MRS. FRANK BALL left early this week to make their home in Melbourne, after returning from their honeymoon at Avalon Beach. Please note, Ria Murch states in her book, R. Murch, Arthur Murch: An Artist's Life 1902-1989 (1997- Ruskin Rowe Press), that 'The Mad Half Mile' was in fact in Waterview Street, Mona Vale and a name given to that area by Sydney Ure Smith in his Australia, National Journal as part of an article run in 1945. "AUSTRALIA, NATIONAL JOURNAL" - Variety is the keynote of "Australia, National Journal." edited by Sydney Ure Smith and Gwen Morton Spencer. The May issue, just to hand, provides entertainment and interest on every page. The witty drawings by Wiz, Wall, Missingham, Molnar and others are evidence of the high standard of Australian humorous artists. Missingham sketches a gentleman "spook" carrying his head (blushing) under his arm who encounters a naked lady ghost. The caption reads, "Boy, was my face RED!" Right: Michaelis, Margaret - circa 1945 - SYDNEY, C 1945. WWII OFFICIAL WAR ARTIST ARTHUR MURCH WITH HIS CAT. Image No. : P00933.005, courtesy Australian War Memorial. Allan Aldous has a good short story about a couple who found a flat after endless searchings, only to be "chiselled" out of it by a cunning trick of another flat hungry couple, in "Other Woman," Charmian Clift convincingly shows how a philanderer is not cured of his fickleness by divorce and remarriage. Book reviews and digests of recent books keep one up to date with the latest writings; "Personality Parade" presents, in photographic and brief sketches, people in the news in Australia. The Murch family lived there from 1940 on in a house called 'Dellwood' and returned in 1945, noting that it had become a 'mecca for artists'. Mrs. Murch states in Chapter 8, 'The Mad Half Mile, Avalon and Other Places' that a photograph taken by Margaret Michaelis for the magazine article from which the phrase comes shows all of them at this property. Another, circa 1945, from the Australian War Memorial archives (above at right) was also taken by the same lady with a description of 'SYDNEY, C 1945. WWII OFFICIAL WAR ARTIST ARTHUR MURCH WITH HIS CAT', so that may be 1945 Mona Vale in the background! Ria states in the opening phrases of this chapter that although these houses had been largely empty in 1940, by 1945 artist Weaver Hawkins and family lived near by as did American Indian artist Raymond Glass, and writers such as poet John Thompson and his wife Pat whose adopted son is well known Jack Thompson, the actor. The Murch family, Arthur, Ria, son and daughter John and Michelle. THE ALAN COPELANDS' new camera-a polaroid which literally produces finished photographs within a minute. You take the photograph, count sixty, then pull out the picture. The camera was tried out at a lunch party at Mr. and Mrs. Claude Healy's beach home at Avalon, when Miss Dorothy Williams and her fiancé, Mr. Dan Dwyer, were among the guests. Sir,-While I agree that the provision of free milk for school children is a worthy object, the more cynically minded may point, out that this scheme should at least do no harm to Dr. Page's fellow Country Party members who depend upon dairymen for support. On the other hand, Dr. Page's suggestion that a means test be imposed before admittance to a public ward in a hospital is manifestly unjust. Though I suffer more than the average amount of illness each year, in 41 years no doctor has prescribed for me any of the drugs in Dr. Page's formulary. I almost qualified last Sunday, when I crushed my finger and the doctor prescribed penicillin ointment. However, I find that although penicillin is a free drug, penicillin ointment is not. Dr' Page's health plan may spell a victory for the B.M.A., but it may well also spell the undoing of the Government Dr. Page supports. Sir,-In time's like these when men are sick of rumours of war yet are prepared to squabble, and scratch open old sores for the sake of a block of sandstone-what a consolation it is to be a common Englishman with no tribal instincts. Neither fish, flesh, fowl, or good red herring. It makes us kin with all men. Do the Scots who glorify the removal of the relic from its old home in Westminster, remember that the Queen of Great Britain which includes the Scot-is herself a Scots woman; and that within living memory, the Scot, the Irishman, and the Welshman, as well as many men of mark from the Commonwealth or the old Empire, have ruled the destines of Britain between them to as great a proportional extent as Englishmen themselves? Sir,-It is not essential that fleets of heavy road transport vehicles should carry pulverising loads of goods for hundreds of miles. Australia possesses a long coast-line within easy reach of the majority of its population dwelling in the coastal strip. It also possesses a few fine ports and many other inlets and estuaries which could, without much trouble, be converted into ports for the smaller types of coastal shipping. Some day, when Australia escapes from the stranglehold which is gripping her unsurpassed port and shipping facilities through varieties of trade-union action, she will possess a lively coast shipping service, when a single unit will transport from port to port as much cargo as hundreds of road vehicles -at a fraction of the present cost. Sir,-In your excellent tribute to the late Field-Marshal Lord Birdwood ("Herald," May 18), you say that he, had a long, distinguished career in 'the British Army. This should have read "Indian Army," in which he served from 1886 to 1930. Like Field Marshal Sir William Slim, and many other distinguished leaders, he was a British officer of the Indian Army, of which he was justly proud. V. C. ALDERSON, Indian Army (Retired). Sir,-Mr. Cahill's argument ("Herald," May 16), that an hour of daylight-saving in winter would not help in black-outs, is not very convincing. We arc constantly told to turn off every light we can. With one hour of daylight-saving, those now retiring at, say, five hours after sunset would then be doing so four hours after, an hour's saving of lights in thousands of homes every night. The two statements don't add up. Either there is error in Mr. Cahill's reckoning or we are putting ourselves to inconvenience every night for no useful purpose. Mr. and Mrs. Harold Cosier, of Warne Street, accompanied by son Ronald, left to-day for Avalon Beach, where their caravan is resting. They expect to be away about three weeks. Their son and daughter-in-law, Mr. and Mrs. Leigh Cosier, of 'Hillcrest,' Curra Creek, have just returned from the same holiday resort. The Immediate Past - President of Manly-Warringah Branch, Mr. T. J. Chegwyn, has been a master builder for about 18 years, and is a well-known cottage-builder in the Avalon Beach district, where he resides. Mr. Chegwyn served his apprenticeship in Baling, London. He came to Australia in 1912 and settled in N.S.W. He was in charge of construction for the Fresh Food and Ice Co. for a number of years. Previous to that, Mr. Chegwyn was engaged on Government Savings Bank works, and building. Before the last war he did construction work in South Australia and New Guinea. He formed the local fire brigade at Avalon Beach and played an active part in fire-fighting. During the war he was in the V.D.C. Mr. Chegwyn was president of Manly-Warringah Master Builders' Association for 12 months. The Treasurer of Manly-Warringah Branch, Mr. Dawson has been a master builder for 30 years. He commenced his career as a cottage builder on "spec," and in later years went Into flat-building in a big way. He has built many of the blocks of flats in his district, and he is one of the oldest-established builders in Manly. Mr. Dawson is an active member of the Rotary and civic clubs, and the Red Cross. He has a family of two boys and a girl. One son, Wally Lawson, is a civil engineer with the Cement Association, and will be remembered as an International Wallaby footballer, having played in England, U.S.A., and the Continent. Avalon Beach Public School - A History - threads collected by A J Guesdon, 2016.